A collaboration between two different breweries brings us the Brooklyner-Schneider Hopfen-Weisse. 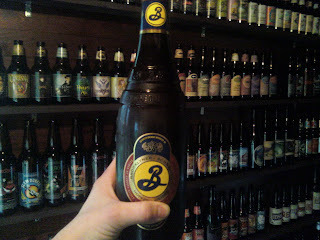 Brooklyn Brewery and Schneider Brewery's brewmasters collaborated on this weizenbock that is similar to Schneider's weisse with a Brooklyn's EIPA hop kick. This is a one time collaboration, so Mike didn't mind dropping $12 on a single bottle. By New York standards , this beer is reletively cheap. With a surprisingly light color, hazy to the eye, the brew pours from the 25.4 oz. with a frothy head and a floral, yet hoppy smell. Given the higher alcohol percentage (8.5%) it is surprisingly light bodied. Tastes of citrus and fruit, it slivers down the throat to welcoming stomach. This brew has the best of both worlds, the light bodied drinkability of a weisse bier with the hop flavor of an IPA the tongue desires.